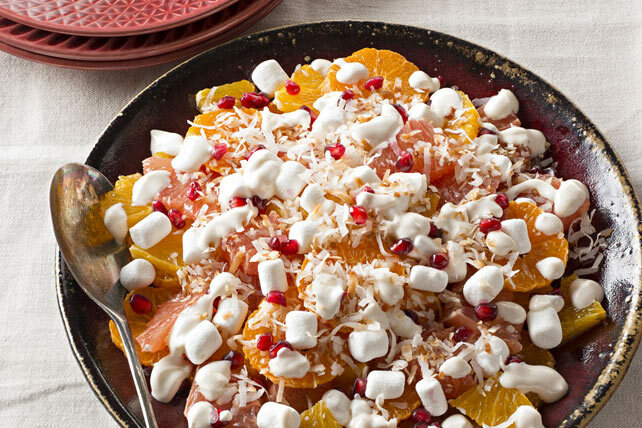 Tangy sour cream coats citrus fruit, mini marshmallows, toasted coconut and pomegranate seeds for a heavenly side-dish salad. Cut orange and grapefruit slices into quarters; arrange alternately on large plate with clementine slices. Top with marshmallows, coconut and pomegranate seeds. Mix remaining ingredients; drizzle over fruit just before serving. Toasting coconut is easy. Just spread coconut evenly in shallow baking pan. Bake at 350ºF for 7 to 10 min. or until lightly browned, stirring frequently. Or, spread in microwaveable pie plate. Microwave on HIGH 3 min. or until lightly browned, stirring every minute. Watch carefully as coconut can easily burn! Substitute orange juice for the honey. Use small sharp knife to cut peel off fruit, cutting under peel to remove white membrane along with the peel.